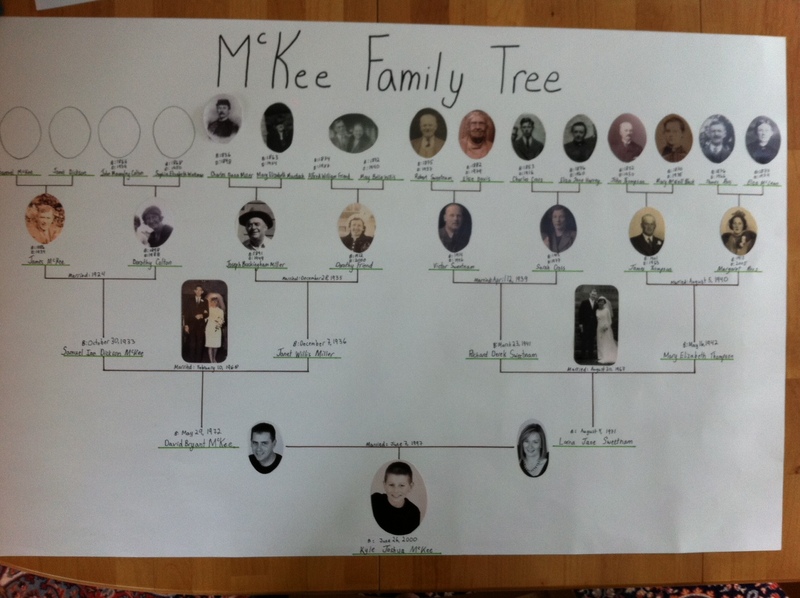 In the public school system in Glastonbury Connecticut I understand that all 5th graders have to do a project on their family tree. Given that our oldest grandchild/grandson is a 5th grader there in Glastonbury, we have received numerous requests for some family pictures. This has been quite a project and has us scurrying about in the nooks and crannies, never mind the cardboard boxes and brown envelopes and even old photo albums. I think the other grandparents have had to do the same. Maybe they have been more organized than we are. It has certainly been an incentive to try to pull things together in a more coherent fashion – both in hard copy and on/in the computer. Now this morning I have been sent the results of Kyle’s project. Those 4 blank ovals in the upper left of the chart have sent us searching a bit deeper. We have found 1 photo so far to fill in 1 of those blanks. And somewhere I have seen another. But I don’t have much, if any, hope for photos of the other 2 great great grandparents. That is a very cute tree! Remarkable accomplishment. Surely much more work required than it may seem at first glance!